Understanding how to choose the best Customer Relationship Management (CRM) software product does not have to be a difficult process if the business owners and their representatives know what is available on the market. The required features of the CRM software are often based on the type of business, the operation’s procedures, customer care requirements and the allotted budget amount. Innovations in technology and the Internet have changed the way many companies conduct business activities. While many of these advances have changed the way companies communicate to their customers, it is also has a substantial impact on consumer buying behavior, thereby providing numerous communication vehicles like the Internet and smartphones to manage various consumer activities electronically. Subsequently, both small and large companies are looking for the top CRM software systems that will allow them to collect, manage and link data about the consumer. The basic goal for most of these companies is to market and sell their products and services effectively. Listed below are some of the top features that companies should look for, especially when the company wants to personalize the consumer’s online experiences. Some companies have large databases of loyal customers that return for repeat services on a regular basis. Even though the consumer may be part of this large pool, each consumer should always feel as if they are receiving personalized and custom services. This image can be given by using a wide variety of different tools including email organizers, help desk software features and numerous enterprise applications. Therefore, it is essential that these types of features are included in the CRM software products that the company chooses. Professionals who are involved in the software decision-making processes will have at least one goal in mind. One of which is to make sure the applications that they choose are user friendly. In fact, no one wants to purchase a software product on a large scale without checking out the interface and its functionality. When searching for the best features, these professionals are normally looking for a user interface that can be described as simple, pleasing to the eyes, and intuitive. As a result, the landing page may be designed with multiple standard components. For example, the company’s representative may be looking for a real-time customizable dashboard that supplies activity feeds for products and services. Another great feature included in some of these software products involve using lots of tasks and personal calendars since they are automatically synced with the individual’s email application. Additionally, each user may access guides on each page to assist them with more advanced functions in the application. With social media at the forefront of many marketing campaigns, it has become increasingly important for companies to gain insight into what their target audiences are talking about on a wide diversity of social media forums including Google+, Facebook, Twitter, and LinkedIn. Therefore, it is important for companies to provide certain tools within their CRM application to obtain this kind of data. With these tools, a company representative can monitor the information, while also responding to the conversations that relate to their organizations. When the company can engage in these activities, they can also post comments to create leads. Drag-and- drop and wizard features are idea for users who want to save time performing a wide variety of different CRM tasks. These features are great for users who want to create standard reports, advertisement campaigns and various types of web forms. Based on the organizations needs, some software products will give the users an opportunity to customize page layouts, set-up new workflows, create and edit modules. All of these functions can be completed via wizards and drop and drag features. One of the best things about these types of features is it saves the users time since they do not have to learn other software applications to perform these and other essential functions. 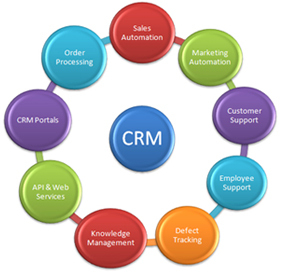 Some CRM software products will also allows their users to implement their system on demand or on premise. Additionally, each organization will have the option of selecting their own cloud service provider. Thereby, giving a representative of the company the power to select a provider that will meet their specific needs. With this kind of option, the company may choose a cloud service provider based on their performance, reliability, and their service level agreement. No customer relationship management software product is effective unless the users of these systems can retrieve the data that they need to keep these operations running smoothly. Therefore, it is important for the company’s representatives to review and evaluate the report features included in the software. In fact, finding the best report features is essential to the success of the overall customer relationship management system. While some companies may require lots of standard reports on a regular basis, others companies may prefer their users to provide customized reports for special projects and requests only. Whatever the case, it is important for users to obtain the information that they need real-time since they may want to track and use the latest information. Also, according to the need, the company’s management may need certain reports scheduled every week or on a monthly basis. In addition to retrieving raw data, some management teams may require the data to manipulated. To accomplish this task, the company representatives should look for features in the software that will allow their users to export the data. For instance, some manager’s may want the data exported to and excel spreadsheet. Once the data has been exported to excel, the report specialists can provide upper management with how many customers the company services in specific geographic locations. In addition to transporting the data to excel, management may want the information in a specific presentation form. Therefore, the user should also have the capability to create numerous types of charts (i.e. pie, bar, funnel, or line charts). By translating the data into a pictorial format, executive management can get a quick image of the company’s current progress. Every company has some type of CRM system. Sometimes these systems may be based on the infamous pen and pencil sets since an employee may track their customers by recording their names and other associated information manually. However, with all of the latest innovations, companies can up-date their processes to a comprehensive CRM software system. Understanding how to choose the best Customer Relationship Management software product can be simplified when the business owners and their representatives know what is available and how to select the software that meets the organizations needs.